A Perfect way to make samosa at Home with inches. Length Should be 9 inches and width should be 3 inches. When you make samosa then you should first fold it into 5 inches. Take a bowl and add Plain Flour, Salt and mix it well and then add Oil and mix it well and then knead the dough with water (dough form should be hard) and then rest it for 20 minutes with the cover on room temperature. Now make small balls of dough (I made 8 with this) and then dust dry flour on kitchen slab and rolling the all bread one by one. Now make layers of the bread. For this take bread and spread oil and dust dry flour and then put second bread on it and then spread oil and dust flour and then put 3rd bread on it and then spread oil and dust flour. follow this method for all 8 pieces of bread. But last bread should be dry (do not spread oil). Now rolling this layered bread until it becomes too thin. After that take a tawa/pan and slightly preheat it and put this bread on it and cook for 30 seconds each side. After that separate each bread from it immediately. Now take a scale and cut this breads. Length Should be 9 inches and width should be 3 inches. 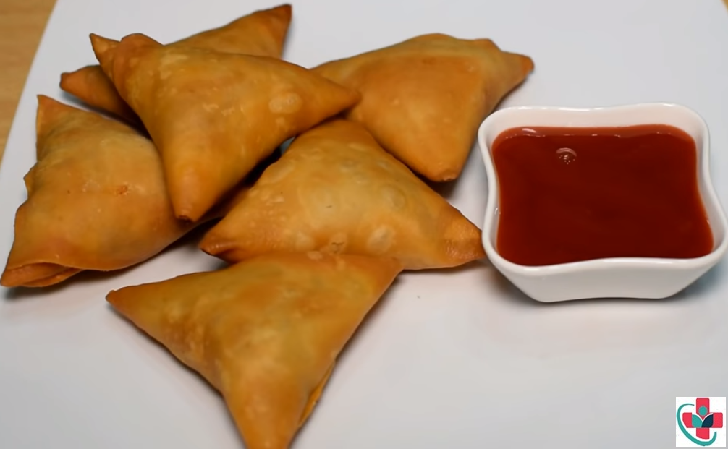 When you make samosa then you should first fold it into 5 inches and then fold it (For this Watch Video) and then fill it and fry until it becomes into golden brown color. You Perfect Shape Samosa is ready.